Lone Pine Writings is a set of “transmissions” posted on Energetic Forum. They were written on my lap in the front seat of my car in the middle of the desert in Lone Pine, California. This particular book is a compilation of those papers specific to electrical engineering terminology, definitions and basic equations. 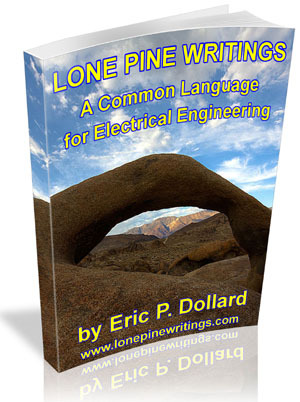 This is a must read for any electrical engineer no matter what kind of background they have. This book is a fund raiser for EPD Laboratories so please support my work by getting a copy. Even if you have the previous copy, which was distributed by someone without my permission and I never recieved a dime from it, please consider purchasing this newly formatted edition. It is released with my full approval and I’ll actually get something out of it this time.